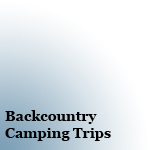 Backcountry Camping Trips are reviewed after I complete the trip. Generally they will be 2 or more night trips involving formal Backcountry sites. Backcountry Camping reviews are based on the overall view, condition and enjoyment of the trail and campgrounds. Elevation and distance are rough estimates based on maps and other data.